Some very apt books have come my way in the last week or so and this is one of them. 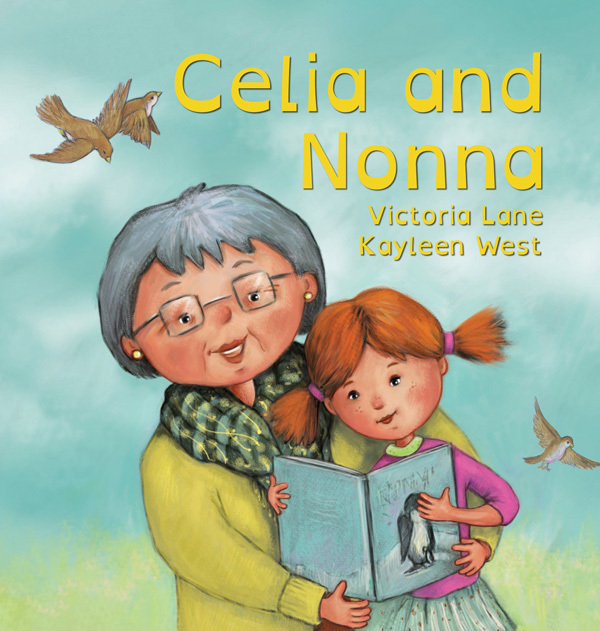 This gentle and loving story of a little girl and her much-loved Nonna, and the changes that occur when Nonna’s memory starts to fail is so very pertinent to our family at the present time. It is difficult for little ones to understand that aging family members cannot always remember things, or indeed that they may change where they live. On Friday we celebrated my mother’s 88th birthday and at times it is tricky for the two youngest great-grandchildren to understand why Nanny now lives in the place she does, or why she doesn’t remember everything. Celia loves sleeping over at her Nonna’s place. She always has a fuss made of her and she and Nonna cook together and play special games, but when Nonna starts to forget things, locks herself out of the house and so on, Nonna moves to a special place where people can help to keep her safe. There is no room for Celia to sleep over any more and nowhere to cook – but there is room to put lots of drawings up on walls of the fun things that are special memories. In just the same way, Miss Just-Turned-Five spends much time creating beautiful artwork for her great-grandmother, just to make sure Nanny knows how much she is loved. It was difficult for me to read this without emotion because of the intensely personal circumstances but this is a superb book to share with little people who are facing changes in their family due to aging, dementia or Alzheimer’s disease. The text and illustrations are simple, gentle and suitably engaging for a young audience – the endpapers are truly gorgeous (many of my friends and students know about my rapture over endpapers!). Highly recommended for home and library shelves for sharing with small people from around 4 and up. Check out Kayleen’s website and Victoria’s here. Forget Michael Palin or any other famous world-tripper for your armchair travels! 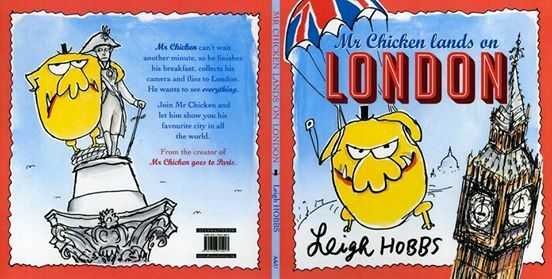 Mr Chicken is back and after his famous trip to Paris, is ready to take readers on a new and thrilling encounter with his favourite city of all – London. His exciting landing on London brought to mind that wonderful episode of ‘the Queen’ parachuting into the Olympics. 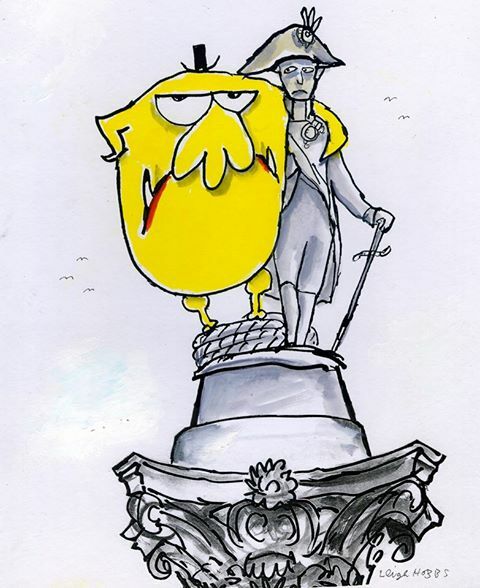 Only the suave and sartorially elegant Mr Chicken would be capable of upstaging H.M. Queen Elizabeth, being more a drawcard in the Tate Gallery than the exhibited artwork and causing passersby in Trafalgar Square to look upwards wondering ‘Who’s that guy up there with Mr Chicken?’. Leigh Hobbs is consistently an unequalled hit with his audience, no matter which of his characters, and there is something particularly endearing about Mr Chicken with his ineffable ability to blend in effortlessly in any company, whether distinguished or lowly. He so completely sets the tone for all that is deemed elegant and socially desirable. For young readers this is a terrific way to show them vicariously the highlights of that great metropolis which is London with its long history and famous icons. The vibrant colours and superb facial expressions of Mr Chicken as well as his adoring public are just as engaging as in the previous trip to Paris. I have been a chicken devotee for many years and admit that all my chookies have had fantastic personalities but none that could hold a candle to the inimitable Mr Chicken. Highly recommended for readers 3 and up – who will no doubt look forward to the next exciting adventure! There is so much to envy in someone whose talent extends not only to the writing of engaging stories but also the outstanding illustrations – brilliant Mr Hobbs! Visit Leigh Hobb’s website here and stay posted for an upcoming blog interview with Leigh Hobbs soon! Digital Citizenship is a particular topic for me at present so this book came along in a very timely space. Easy to read with sensible straightforward advice for parents of children from pre-schoolers to teens, the contents cover all aspects from cyber safety to addiction. Should parents be not very ‘tech’ minded there are useful explanations of various programs, apps and digital spaces as well as an extensive glossary. A final chapter of websites for additional information and advice is also a practical and useful extension to the commonsense approach throughout the book. 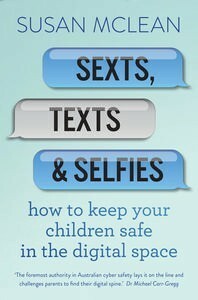 Chapters include: Your Child’s Digital Reputation, What are Children Doing Online?, Cyberbullying – the Survival Guide and Sexts & Selfies – What Will They Think of Next? Recently ACMA (Australian Media and Communications Authority) published its most recent snapshot of young people online, stating that the the numbers of young people online has doubled since 2009 and offers many strategies for managing your children’s digital citizenship. Read more here. This book strongly advocates parents to take charge of their children’s digital well-being – just as they do with their physical and emotional care. In my opinion, this is a book for you to promote heavily to your parent community and make available in your Parent Resource collection. Susan McLean began her journey into Digital Citizenship as a member of the Victoria Police Department and an investigation into cyber bullying back in 1994. Since then she has worked diligently to educate both kids and adults in this increasingly more complex cyberspace. Highly Recommended for both parents and teachers. This is a coming-of-age novel with a difference, described as ‘hilarious, romantic and wildly imaginative’ and it is all that indeed. Boy is the son of Frankenstein’s Monster and his Bride and as you can imagine this is not a family that could easily fit into a normal human suburban life. Instead they live in a community of magical creatures in a labyrinth underneath a Broadway theatre which continually runs a magical show featuring all the assorted societal misfits of the commune – the Diva (Medusa), troll dancers, Charon the ferryman who acts as stage hand, the Siren whose act befuddles every adult audience and led by the redoubtable undead Ruthven. Boy’s only interaction with the world of humans is through the internet where he hangs out with other geeks and pursues his passion for creating coding. Like all teenagers he chafes at the restrictions of his life and yearns to escape the rigidity of his confined existence. 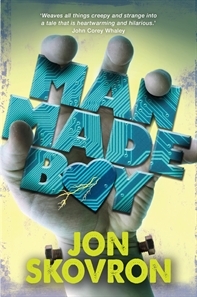 When conflict with his parents escalates Boy takes off and attempts to fit into the human world, banking on his newly created super code to fund his adventure. But something goes seriously wrong. His code evolves itself into a powerful Artificial Intelligence which begins to stalk him with disastrous results. As Boy attempts to dodge and destroy VI (Virtual Intelligence), his own creation, he is led to other magical enclaves where he meets up with more mythical misfits and embarks on a bizarre road trip with the granddaughter/s of infamous Dr Jekyll/Mr Hyde. Their cross country trek introduces Boy to country diners, shopping malls, undisguised curiosity by strangers, danger, love and heartbreak. However, no matter how he tries to escape his own creation, the time comes when he must face it down and rescue his family. A wonderful story of wild adventures, acceptance and tolerance, the importance of family support and being true to oneself. This was a real page turner and fun to read – both male and female young adults, from around 14 up would find it immensely appealing. Some strong language and sexual references would lead me to suggest that your older readers would be the most suitable audience. I quickly put my hand up to review this as this dark period in Sydney’s history fascinated in a ghoulish way as a child growing up in the Harbour City, and since (the only series of ‘Underbelly’ I watched was the “Razor” one). Imagine my surprise when I realised this version of events had a paranormal edge: a fact which made it all the more intriguing. Kelpie, is a wild child, growing up an orphan in the dangerous neighbourhoods of 1930s Sydney. She is a small survivor: undernourished, underdeveloped but very intelligent and certainly streetwise. She is careful to keep herself safe and – she sees ghosts. The spectres of so many who have died, either violently in this mayhem of gang rivalry or just those who have passed on, appear to Kelpie usually at the point of their demise. One such ghost, Miss Lee, laboured to teach Kelpie to read and kept her as safe as a ghost possibly could. Misled by a mean spirit, Kelpie enters a tatty old boarding house seeking apples, and is confronted by the bloody corpse of Jimmy Palmer, right hand thug of the notorious Glory Nelson. At the same time, Jimmy’s latest girlfriend, Dymphna arrives at the scene. Dymphna is Glory’s best ‘girl’ ( yes, prostitute) and in lightning speed, Kelpie and Dymphna are thrown together to evade police and tread the delicate and potentially disastrous line between rival mob bosses, Glory and Mr Davidson. The most extraordinary aspect of this uneasy alliance is that Dymphna also sees ghosts – and despite their outward differences in physical appearances with Kelpie as small as an 11 year old and Dymphna as glamourous and grown up as 20 year old – they realise with a shock that they are both sixteen. Both girls have a history which makes one empathise with each in their precarious situations. Razorhurst is vibrant, bloody, gripping and at times shocking. It is an extraordinary take on well known factual history of Sydney’s bloodiest episode in history. Although the recommended reading age is 14 up, I would suggest for a school library that you might choose to confine this one to your Senior Students. It is a great read, but at times graphic and raw. Author’s website here and teaching notes here. 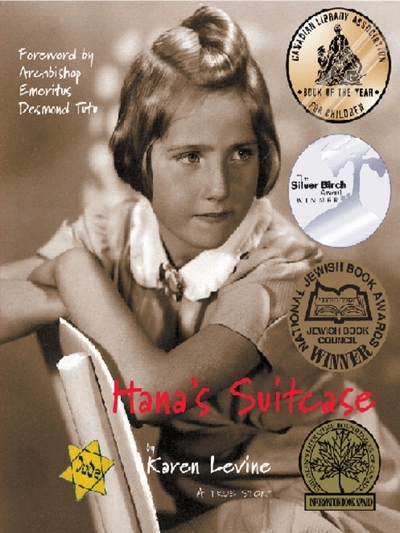 There would be few people who remain unaware of the poignant story of Hana’s Suitcase and the diligent unravelling that brought a young Holocaust victim back to the living. After the successful radio documentary, numerous awards, film documentary, years of touring and travelling and speaking by the author Karen Levine, the determined Fumiko Ishioka, Hana’s brother Georg as well as his daughter Lara, this tenth anniversary of the book republishes the original text and adds a wealth of updated information and images. The main participants in sharing Hana’s ill-fated story with modern children, in their stalwart endeavour to spread the message of peace, each add their reflections on the past ten years. There is also much additional material in the messages, images and poetry from children all around the world. “From little things, big things grow” is very apt in this instance. When Fumiko, curator of the Japanese Holocaust Education Centre, requested a child’s artefact from the Auschwitz Museum, to be the focal point of an educational program and exhibit ‘The Holocaust through the Eyes of a Child’, she little thought that her group of dedicated students would spur her on to uncover the truth about Hana Brady’s fate in the darkest days of human history. When Hana’s suitcase arrived from Auschwitz, bearing only her name and the information that she was an orphan, there was scant evidence to piece together the rest of the puzzle. How fortunate that this remarkable young woman refused to be daunted and kept on digging until she was not only able to piece together Hana’s history but become connected with Hana’s brother and in a small way help him heal after sixty long years. I can only say if you have not yet read this – you must – and share it with all young people who are able to appreciate the enormity of both the atrocity and the challenge to restore Hana to her living family. Highly recommended for readers 10 and up. Visit the Brady Family museum here. Scottsdale High seems a pretty average high school with the usual groups of teens including those who are popular and those who are not. ‘Butter’ is a 16 year old boy who is clever and funny, plays saxophone like a professional Blues musician (Charlie Parker is his idol) and drives a BMW, a not uncommon car choice in his neighbourhood, even for teens. You might think Butter would have no problem fitting in with his peers except for just one small, or not so small, detail. Butter weighs in at over 400 pounds. His obesity is not a focus for active bullying by schoolmates, rather it has the effect of making him almost invisible. He is completely and utterly ignored by all and sundry. Everyone calls him Butter, no one knows his real name or anything about him (to find out why he has that nickname is to realise that dark deeds are possible when people stand by and do ‘ nothing’). Butter retreats into his own world of his saxophone and the Internet where he is presently engaged in a cyber-flirtation with his dream girl Anna,using a pseudonym. At home he cocoons himself in his room where these two joys sustain him in his loneliness. Butter’s situation is not helped by his parents, of whom Lange paints a fairly critical picture – a helicopter mother whose solution to everything is food and a financially successful father who is revolted by his son’s condition. Butter’s isolation and depression grow exponentially despite well-meaning efforts from his favourite teacher, the Professor, who endeavours to focus on Butter’s exceptional musical ability and persistently aims to engage Butter in the band group; his friend Tucker, from FabFit (summer fat camps), also attempts to bolster Butter’s frail ego without avail. With the realisation that the Internet provides not only anonymity for those who crave it but can also invite an audience, Butter decides to put himself into a macabre limelight by setting up his own website and vowing to eat himself to death on New Year’s Eve. In a ghastly parody of social popularity, Butter finds himself the centre of attention from new ‘friends’ and on his way to being a dubious kind of ‘hero’ amongst the ‘Barbies and meat-headed Kens’ of Scottsdale High. However, the closer the date with death comes, the more Butter is forced to analyse his thinking, his decisions and his life – or death – style. 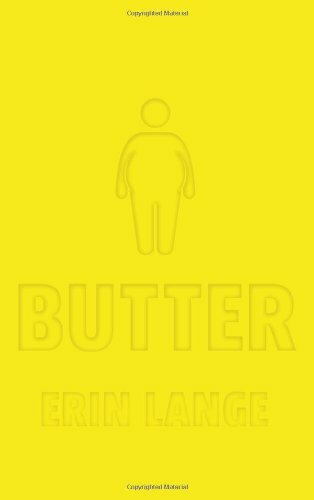 Providing the reader with an intense scrutiny of bullying from another angle and the oft-times detrimental implications of social media fame, Butter is a darkly humorous but confronting must-read for young adults and adults alike,. Trailer and study guide available via the author’s website. What a delightful Early Reader book this is! Apparently first released 1999, this a super picture book with simple text and striking illustrations for beginning readers. Earthy colours and an array of Australian native fauna are combined to give the developing young reader a resonant reading experience. This is the Australian version of those wonderful PM Early Readers my Year 1s thrived on many years ago. The rhyming text is not complex but also never dull. Shane Morgan, can you please do some more? I love the simple and repetitive but not ‘same’ text and I adore the stylised illustrations with the echoed colours. Look at the emu, running so fast. See the emu, he caught me at last! If you have Preppies, children challenged to read or young disengaged readers, this is a terrific book – and I do hope to see more. Highly recommended for emerging readers or your kids who may be struggling with reading.